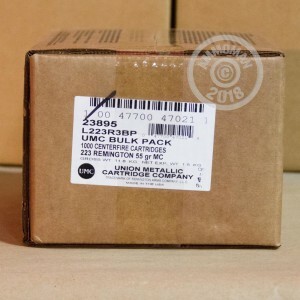 Whether you call it FMJ or Remington's designation, "Metal Case," this .223 Remington ammunition is a great deal for all your AR-15 target shooting needs. Each 1,000 round case is loose packed with plastic wrappers and no fancy packaging to drive costs up. It's the perfect choice if you like to just open a box and start loading up your mags. 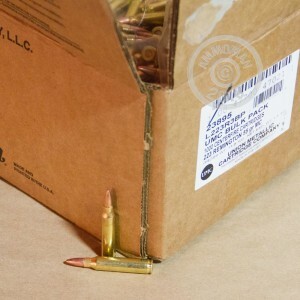 Each cartridge in this case fires a 55 grain full metal jacket bullet at a muzzle velocity of 3,240 feet per second. This gives it a similar trajectory as M193 ball ammo in 5.56 NATO. Remington ammo is loaded in Lonoke, Arkansas using non-corrosive Boxer primers and reloadable brass cases. This is commercial ammo, so the brass has been polished to remove annealing marks. Get free shipping from AmmoMan.com on this case or any other items totaling $99 or more!